This page presents an overview of the developmental tasks involved in the social and emotional development of children and teenagers which continues into adulthood. The presentation is based on the Eight Stages of Development developed by the psychiatrist, Erik Erikson in 1956. According to Erikson, the socialization process consists of eight phases – the “eight stages of man.” His eight stages of man were formulated, not through experimental work, but through wide-ranging experience in psychotherapy, including extensive experience with children and adolescents from low – as well as upper – and middle – social classes. 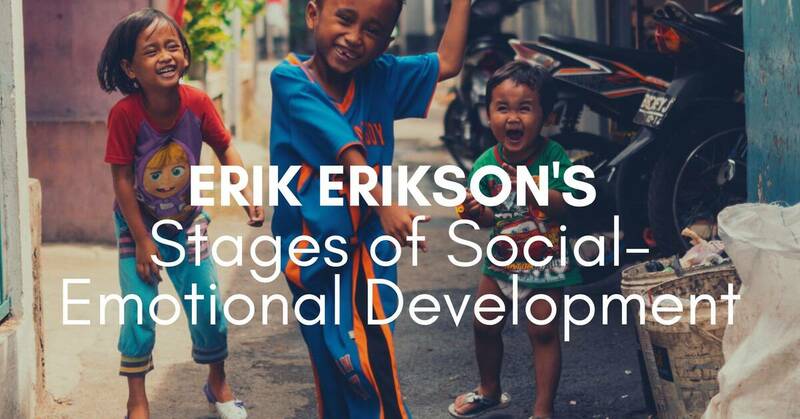 Each stage is regarded by Erikson as a “psychosocial crisis,” which arises and demands resolution before the next stage can be satisfactorily negotiated. These stages are conceived in an almost architectural sense: satisfactory learning and resolution of each crisis is necessary if the child is to manage the next and subsequent ones satisfactorily, just as the foundation of a house is essential to the first floor, which in turn must be structurally sound to support and the second story, and so on. Chronologically, this is the period of infancy through the first one or two years of life. The child, well – handled, nurtured, and loved, develops trust and security and a basic optimism. Badly handled, he becomes insecure and mistrustful. The second psychosocial crisis, Erikson believes, occurs during early childhood, probably between about 18 months or 2 years and 3½ to 4 years of age. The “well – parented” child emerges from this stage sure of himself, elated with his new found control, and proud rather than ashamed. Autonomy is not, however, entirely synonymous with assured self – possession, initiative, and independence but, at least for children in the early part of this psychosocial crisis, includes stormy self – will, tantrums, stubbornness, and negativism. For example, one sees may 2 year olds resolutely folding their arms to prevent their mothers from holding their hands as they cross the street. Also, the sound of “NO” rings through the house or the grocery store. Erikson believes that this third psychosocial crisis occurs during what he calls the “play age,” or the later preschool years (from about 3½ to, in the United States culture, entry into formal school). During it, the healthily developing child learns: (1) to imagine, to broaden his skills through active play of all sorts, including fantasy (2) to cooperate with others (3) to lead as well as to follow. Immobilized by guilt, he is: (1) fearful (2) hangs on the fringes of groups (3) continues to depend unduly on adults and (4) is restricted both in the development of play skills and in imagination. Erikson believes that the fourth psychosocial crisis is handled, for better or worse, during what he calls the “school age,” presumably up to and possibly including some of junior high school. Here the child learns to master the more formal skills of life: (1) relating with peers according to rules (2) progressing from free play to play that may be elaborately structured by rules and may demand formal teamwork, such as baseball and (3) mastering social studies, reading, arithmetic. Homework is a necessity, and the need for self-discipline increases yearly. The child who, because of his successive and successful resolutions of earlier psychosocial crisis, is trusting, autonomous, and full of initiative will learn easily enough to be industrious. However, the mistrusting child will doubt the future. The shame – and guilt-filled child will experience defeat and inferiority. During the fifth psychosocial crisis (adolescence, from about 13 or 14 to about 20) the child, now an adolescent, learns how to answer satisfactorily and happily the question of “Who am I?” But even the best – adjusted of adolescents experiences some role identity diffusion: most boys and probably most girls experiment with minor delinquency; rebellion flourishes; self – doubts flood the youngster, and so on. Erikson believes that during successful early adolescence, mature time perspective is developed; the young person acquires self-certainty as opposed to self-consciousness and self-doubt. He comes to experiment with different – usually constructive – roles rather than adopting a “negative identity” (such as delinquency). He actually anticipates achievement, and achieves, rather than being “paralyzed” by feelings of inferiority or by an inadequate time perspective. In later adolescence, clear sexual identity – manhood or womanhood – is established. The adolescent seeks leadership (someone to inspire him), and gradually develops a set of ideals (socially congruent and desirable, in the case of the successful adolescent). Erikson believes that, in our culture, adolescence affords a “psychosocial moratorium,” particularly for middle – and upper-class American children. They do not yet have to “play for keeps,” but can experiment, trying various roles, and thus hopefully find the one most suitable for them. The successful young adult, for the first time, can experience true intimacy – the sort of intimacy that makes possible good marriage or a genuine and enduring friendship. In adulthood, the psychosocial crisis demands generativity, both in the sense of marriage and parenthood, and in the sense of working productively and creatively. If the other seven psychosocial crisis have been successfully resolved, the mature adult develops the peak of adjustment; integrity. He trusts, he is independent and dares the new. He works hard, has found a well – defined role in life, and has developed a self-concept with which he is happy. He can be intimate without strain, guilt, regret, or lack of realism; and he is proud of what he creates – his children, his work, or his hobbies. If one or more of the earlier psychosocial crises have not been resolved, he may view himself and his life with disgust and despair. These eight stages of man, or the psychosocial crises, are plausible and insightful descriptions of how personality develops but at present they are descriptions only. We possess at best rudimentary and tentative knowledge of just what sort of environment will result, for example, in traits of trust versus distrust, or clear personal identity versus diffusion. Helping the child through the various stages and the positive learning that should accompany them is a complex and difficult task, as any worried parent or teacher knows. Search for the best ways of accomplishing this task accounts for much of the research in the field of child development. Socialization, then is a learning – teaching process that, when successful, results in the human organism’s moving from its infant state of helpless but total egocentricity to its ideal adult state of sensible conformity coupled with independent creativity.